You can use left over Homemade Pizza or roll dough to make delicious cinnamon rolls. I took the left over dough that had already risen once, punched it down and plopped it down on a floured surface. Using my french rolling pin (you can use what ever type of rolling pin or your hands if you like!) to roll it out - about 1/2" thick. I softened a stick of unsalted butter, smeared that liberally over the top of the rolled out dough. I then sprinkled a mixture of cinnamon sugar(1/2 C. sugar and 1/4 C. cinnamon) over the top of the softened butter. If you want you can sprinkle raisins or pecans on this at this time. Started with the long side of the rolled out dough, started rolling the dough toward the other side of the dough - like a jelly-roll.pinch the edges to seal it. Slice the dough into 1 1/2" to 2 inch pieces. Arrange dough pieces, cut side up, in a greased 12-inch deep dish or round cake pans. Cover dough with a clear plastic wrap or clean flour sack dishtowel (this is what I use). Let raise until doubled in size - anywhere from 45 minutes to 1 hour. Bake in a 375º oven for 20-30 minutes or till light brown. If necessary, to prevent over browning, cover the rolls loosely w ith foil the last 5-10 minutes of baking. As the rolls are cooling slightly, mix up the following for the glaze: I like to drizzle this on my rolls, letting the glaze flow into the crevices and then lick the bowl if you want! add milk to make creamy and spreadable. Well the long of the short of it, we had so much dough left over that I was able to make a huge batch of cinnamon rolls for this morning's breakfast! The kids were thrilled and the house smells just yummy! Mix the above in a sauce pan and let simmer for about 10 minutes. I usually make a double or triple batch of this and cold pack can the rest or stick it back for the next week's pizza. Mix 3/4 c. warm water and 1 1/4 tsp of yeast (I used fast rising yeast) and let set for 5 minutes. It should foam up a bit. Add 1/2 Tbsp olive oil, 1 1/2 tsp. salt, 1 Tbsp. sugar and mix well. Mix in 1 C. flour and mix well, continue adding flour a cup a at a time, mixing well. Making sure the dough is smooth and elastic. Knead well on a well-floured surface until smooth in texture, about 10 minutes. Cover and let rise until the dough has doubled in size - 1-2 hours. Each batch of dough will make one large or two personal pan pizzas. Making the dough really doesn't take much time, but it seems that everyone loves to have a different kind of pizza. To solve the problem, I use round cake pans to make personal pan pizzas! The dough recipe I use will make 2 personal pan pizzas or 1 large pizza per batch, so it is easy to figure out how many batches to make. I spray the cake pans with Pam Olive oil, roll out a small (a little bit larger than my fist) portion of the dough, and place it in the pan. I use my pizza cutter to cut off the excess dough by rolling the blade around the edge, just above the dough. You can make a thin or thick crust depending on how thick you roll out the dough. Put on your layer of sauce and create away. We lay all the ingredients out in containers and everyone can either construct their own pizza or I can make them up for them. Bake at 350 degrees until the cheese is melted and pizza looks done. My family loves a good cherry pie and this is one that I frequently take to gatherings. 2 cans of cherry pie filling (I use Comstock, but you can use Lucky Leaf or whatever is available). Okay this is one of those pies that I don't really use a recipe on, but go by taste. Preheat oven to 450º, remove chilled pastry dough from the refrigerator and set aside. Pour the contents of the pie filing in a large bowl, add a bit (maybe 1/4-1/2 tsp.) of almond extract and about 1/4 cup of sugar or less. Taste. Adjust by adding more extract or sugar if you need and taste again. I love this part! If you want the filling to be a bit thicker, you can take some of the filling, add a tablespoon or two of flour or cornstarch. Once it is blended in nicely, add it back into the rest of the pie filling and stir gently until it is uniform (blended in well). Roll out the bottom crust and fit into 9-inch pie plate, trimming to 1 inch beyond the edge. Lay the top crust over the filling, sealing and fluting the edges; cut steam vents in the top. My kids love it when I do a fancy lattice crust. ** Just remember that it needs to be vented so if you just lay a solid crust over it, use a knife to slit a few places, so the steam can escape. Bake 15 minutes, then lower the oven temperature to 350º F and bake 40-50 minutes or until the crust is golden. You might want to put a cookie sheet below your pie in case there is any overflow. This will save you from having to clean your oven. Remove pie from the oven and cool slightly on a wire rack. Serve warm and adda scoop of vanilla ice cream if desired. A friend from church gave this to me when I was first married and it has been a hand-down easy favorite! It is so simple to make for 1-however many you need, and is so delicious!!! Thinly slice 1 medium potato per person. Spray baking dish with Pam or Crisco. Put 1 layer of potatoes, covering the bottom of the dish and lightly salt and pepper. I don't always peel the potatoes, more vitamins are retained that way. Lightly cover the potatoes with shredded Colby or Colby Jack cheese. Thinly slice butter and dot these on the top of the cheese (do not cover the top with butter or it will be greasy. No more than 1-2 tablespoons cut up into small pieces. Repeat steps 1-4 until you’ve run out of slices or room. On the last layer, top it nicely with cheese, and finish with the butter and dusting of flour. Using 1-2 cups of hot whole milk, pour over layers until milk appears ½ way up on the dish. If you use too much milk, it will be very runny. I usually take a conservative side with this. Sometimes I'll put this in the microwave to cook for 20 minutes if I'm in a hurry. If you do this, please use Plastic Wrap to cover it. With the chill in the air and frost on the lawn, my family begs for those comfy winter dishes that we love. One of those main staples for the winter is Cornbread and Chili. My father-in-law loves my cornbread and chili, and I've been known to made up a huge batch so I can leave some with them. I love it when the family gets excited about something being done in the kitchen. I must confess that my chili recipe is nothing special. I get a package of 2-Alarm chili (except the red peppers), add a pound of cooked deer or turkey meat, brown a pork chop, cut that into small pieces. throw it in with a couple of cans of tomato sauce (maybe even a can of diced tomatoes), throw in a few cans of pinto beans, a cut up stalk of celery, and a few tablespoons of brown sugar. Let it simmer in the crock pot or in a dutch oven for an hour or two (if you're not in a hurry). Now my husband is originally from Indiana and he loves his chili mixed with elbow macaroni. That makes me think more of something they used to serve us in the cafeteria in school, but I like my chili on a baked potato with lots of cheese! One of my favorite cookbooks is by Linda Fisher, The Muffin Lady. She does things simply with her hands and with her heart. I love her cornbread recipe - and wanted to share it with you. . Best served on a cold day with butter and jelly (if you're like my hubby). Preheat the oven to 350º. Allow 10 minutes for preheating. Put the butter and oil in a 9 inch square cake pan (Sometimes I make my cornbread in an iron skillet instead of a stone square pan and place in the oven until the butter melts and browns, approximately 10-15 minutes. Make sure the oil/butter coats the sides of the pan/dish you are using, so you have a smooth release. Combine all dry ingredients, make a well in the center. Add the eggs and milk, stirring well. Pour the melted butter and oil on top and stir gently until completely blended. Pour the batter into the same pan used to melt the butter/oil. Bake for 20-30 minutes or until light golden brown. *Y ields about 8-10 servings. I remember my Mom making this when I was growing up and so I continued to do this once I got married, but most people around this area have not heard of fried apples. We love to fix them when we have company and are doing a home cooked meal. Most of time we get a reaction of "Um, can you tell me what this is?" Only our former minister's family had ever heard of or fixed them. This is an easy dish that we serve with our meal and not as a dessert. They will not look like a traditional fried food (hard and crispy on the outside, rather they will be tender when fully cooked. I like to use a harder type apple (Pink Lady, Rome, Braeburn). Core and slice some apples – about 1-2 for each person that you’re fixing dinner for, into wedges and then cut those in half. You’ll have a bunch of little wedges. Put some butter (you MUST use REAL butter) in a skillet (I use a non-stick skillet) and melt over medium heat. As the apples are cooking you may need to add some more butter if it looks like you don't have enough - make sure the butter doesn't cook completely out or they will burn. Add the apples; stir/turn the apples to make sure that all are coated by the butter. 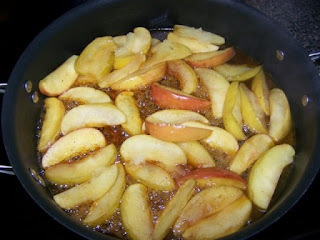 Sauté 15 to 20 minutes or until apples are tender, but not too soft or too brown. If you cook them too long they might become gooey. You will need to turn them from time to time to ensure even cooking. Some people like to add some cinnamon and nutmeg, though I never have. top when done). It's okay to stir and mix this in the casserole dish. Sprinkle with cheese. cover with foil and bake for 25 minutes or until hot and bubbly. **I love to add in Parmesan, mozz. and other type of cheeses I have on hand. Finishing with mozz. and Parmesan. If you wanted to, you could add green peppers, garlic, other pizza type yummies. Serve with an Italian flat bread or garlic bread and this is simple and inexpensive meal!